Integrated Data Systems (IDS) foster social innovation through quickening the knowledge-to-practice-development cycle. They accomplish this by linking administrative data across multiple agencies to monitor and track how services are being used and to what effect. IDS provide a more complete account of how different policies and programs affect the individuals they’re intended to serve, which provides agency decision makers with the Actionable Intelligence necessary to better address the often interconnected needs of the citizens more efficiently and effectively. 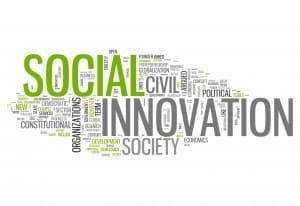 IDS are also used to test social policy innovations through high speed, low-cost randomized control trials (RCTs) and quasi-experimental approaches. IDS can also be used for continuous quality improvement efforts and benefit cost analysis. What Data go into an IDS? Administrative data records that are maintained by public and private agencies share their data across different government agencies to create an Integrated Data System (IDS). 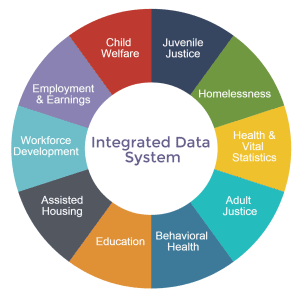 An IDS can include the following shared data: juvenile justice, homelessness, health & vital statistics, adult justice, behavioral health, education, assisted housing, workforce development, employment & earnings, and child welfare. Integrated data reveal patterns of risk and resilience, which, in turn, more readily links cause and effect, allowing executive leaders, policy makers, and policy analysts to test more targeted interventions and higher-impact policies. Develop and test an intervention to look at alternatives to juvenile incarceration, test better methods for addressing truancy, etc.